Matt Madden is a cartoonist who teaches at the School of Visual Arts and in workshops around the world. His work includes 99 Ways to Tell a Story: Exercises in Style (Penguin), a collection of his comics adaptation of Raymond Queneau’s Exercises in Style; a translation from the French of Aristophane’s The Zabome Sisters (First Second); and Drawing Words & Writing Pictures and Mastering Comics, (First Second), a pair of comics textbooks written in collaboration with his wife, Jessica Abel. The couple are also series editors for The Best American Comics from Houghton-Mifflin Harcourt. 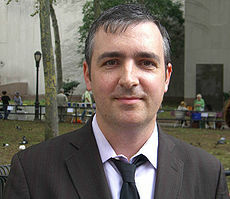 He is currently on an extended residency in Angoulême, France with his wife and their two children. We went Behind the Sestina with Madden to talk about his “The Six Treasures of the Spiral: A Comics Sestina,” featured in The Incredible Sestina Anthology. When did you first discover the sestina? Do you remember the first sestina you ever read? Could you tell us about that? We’re curious about your sestina-writing life. What got you started on writing comics versions of poetic forms? I don’t have much of a background in poetry, but I’ve been reading experimental and formalist literature and comics of one sort or another for a long time. Since I started working on my 99 Ways to Tell A Story: Exercises in Style in the late 90s I’ve immersed myself in the world of Oulipo (Ouvroir de Littérature Potentielle, or Workshop for Potential Literature), the literary supper club/laboratory founded by Raymond Queneau and François LeLionnais in 1960. I found my kindred spirits when I discovered that group and its passion for constraints and formal structures and their application in literature. As it happened, around that same time some French cartoonists had founded Oubapo (Ouvroir de Bande Dessinée Potentielle, or Workshop for Potential Comics) and after a few years’ correspondence they made me a “US correspondent” to the group. When Jason Little described the sestina’s structure to me I was intrigued by the possibilities of that sort of permutational repetition for comics: there are a number of ways you can adapt the concept of repetons to comics: you can have words repeating or images, bits of dialogue, compositional schema, keywords, or, as I did in “Six Treasures,” whole panels. As an author of narrative, I like how the recurring repetons supply story prompts that are always surprising yet have a rhythmic repetition built into them. I feel that even if the final story were seamless there would still be a formal integrity bolstering it behind the scenes—that’s something that’s true about many fixed forms and constraints in general. Since finishing “Six Treasures” I’ve done comics based on the pantoum, the villanelle, and the haiku, and I have notes for a few more sestinas I’d like to try. Some panels from Madden’s “The Six Treasures of the Spiral,” his sestina comic. Can you walk us through the composition of “Six Treasures”? I imagine you coming around to embracing the constraint of having the end/right-most panels adhere to the end word scheme. Did this help determine what kind of story you told? That’s correct. I decided that my repetons would be panels. I then decided to treat the 2-page spreads as “stanzas” because to put six tiers on a page would have made for too dense a comic, at least for my style of cartooning. That implied that my envoi would be one page that would feature all six repeton-panels, leaving me the equivalent of three panels to complete it (in the end I only used two, the final one being a double panel). I played around with different kinds of panels that might work in multiple contexts: ambiguous gestures or expressions, bits of dialogue. At some point I decided that each of the six repeton-panels would show one of the six characters and then used their numerical order as a basis for their names (one=Einiger, two=Twopenny, five=Captain Sank (cinq), etc.). I then pasted up copies of the repeton-panels in their corresponding positions and started filling in the gaps with the aim of telling a reasonable fluid story. I roughed out a whole version that I scrapped because it wasn’t working before coming up with the final repeton-panels. To jump back a step: The first thing that really got my brain working was the image of the spiral that you can use to figure out the order of the repitons (so I’m very happy it’s on the cover!). I probably also had that Kipling sestina in mind but I started to think about whirlpools and I had a notion to try to adapt Poe’s “Descent into the Maelström” which didn’t work out but which left me with the idea of a maritime adventure and a tragic ending at the bottom of a giant whirlpool. The maritime theme got me thinking about visual sources to draw from: Roy Crane’s adventure comics, Alex Raymond’s elegantly swooping lines he uses to indicate weather and water in Flash Gordon, and Hergé’s Tintin. I love how you integrated the idea of the “spiral,” so integral to the sestina and its origins, into the sestina itself. This self-referential move is part of a rich tradition in sestinas, the “sestina about writing a sestina.” Is that part of what you were going for, or was it more of an easter egg thing, something for the sestina smart fans? I suppose it’s a bit of both. I like work that references its own creation but I also enjoy the old-fashioned illusionistic possibilities of storytelling. So while it’s not overtly a meta-comic, there many clues and references that a close reader will pick up on, most having to do with the idea of the spiral and the number six. 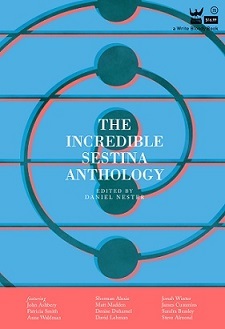 Finally, the first sestinas were always dedicated to someone—to whom would your sestina be dedicated? This entry was posted in Behind the Sestina and tagged Arts, Behind the Sestina, comics, elizabeth bishop, form, Incredible Sestina Anthology, Matt Madden, Oulipo, Poetry, Raymond Queneau, rudyard kipling, School of Visual Arts, Sestina, six treasaures, spiral, The Incredible Sestina Anthology, the six treasures of the spiral: a comics sestina. Bookmark the permalink.